Let me just start by saying I absolutely love Zappos. True, I can get shoes much cheaper at Sierra Trading Post. And Zappos hardly ever reduces their shoes — at least not the ones I have bought from them. Oops, let’s back up a second. Several times I have bought shoes, and a week or two later they have been reduced, much to my frustration. But, anyhoo . . .
I’ve been looking for a good, really good, pair of sandals. I saw some on Mikelle’s mother-in-law during her baby shower in July. I instantly fell in love with them. She bought them at Sportsmen’s and I’ve looked there the several times I’ve been in Utah. I even looked when Mikelle and I went to Rock Springs last month for our getaway-manicures-and-Applebees-day. One day when Tracy, Mikelle and I were all in Logan [during the hair coloring marathon] we three stopped in at Al’s Sporting and tried on a myriad of Chacos, Reefs, Keens and Tevas. Nothing. Nothing that really clicked for me. Nothing that was just like Barb’s, Logan’s mother. Are these cute, or what! Love, LOVE, the strappy flower. So I started looking online and knew I couldn’t afford the regular prices at Zappos. Too pricey and too much of a splurge for me, financially. I was in the market for end-of-summer clearance and Zappos pretty much skips over that phase. Finally I bit the bullet and sent in an order. Two pair [black and navy] Keen Newport H2s and one pair of Keen St. Barts which were similar to Barb’s. The Newports are pretty big and clunky and they weight a lot. They were also a little tight, so I reordered them in a half-size bigger. And I went ahead and kept the St. Barts’s although they were a little too big. I could tell after just an hour that I wasn’t going to enjoy them as much as I had anticipated, but I had already worn them outside. Oh, I was getting cross at myself because now I couldn’t return these $70 sandals. So then I reordered this one in a half-size smaller and ordered the other two in a half-size larger. See, I wear socks with the others and needed a little more wiggle room. The St. Barts are slip-ons and are worn without socks, so that’s why they were too big and sloppy. I thought I’d try to sell the ones I had worn a couple of days on eBay or send out an email at work because there are lots of teachers who wear Keens in our District. A couple of days later I still hadn’t really loved the Newport H2s either, with or without socks, and couldn’t really bring myself to pay $95 for a pair of shoes I didn’t absolutely adore! I got back online and ordered another 5 pair of shoes, determined to find the exact match for me. That’s right. When you add them all up, that’s 8 pair of shoes. Oh my heck! This time I ordered the Callistogas in two sizes and St. Barts in three sizes. Double ugggggghhhhhh!. Not really what I wanted! So yesterday I looked once more for something a little lighter and ordered two of the Keen Venice — which is what I should have ordered in the first place! Well, I’m nearly happy and totally broke. I need to box up and send back eight pair of Keens. They are spread all over both couches and the ottoman in the front room. I’m thinking I should have learned the last time I did something very similar to this that I really need to shop in a store, try things on, find what I love and then just buy them. Who really cares if I save $5-10? I really could have saved about five hours and countless buckets of stress and worry and all this shipping back and forth. And now that it’s nearly freezing outside, I’ll put these two pair of sandals in the closet until Spring and hope I will still love them as much by then. Love it! 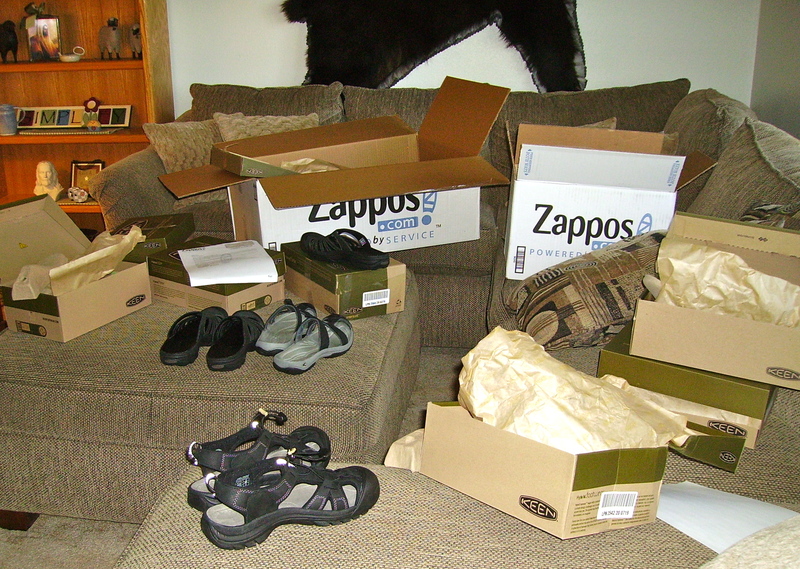 Well, I wouldn’t if I had shoes strewn all over my living room… oh wait! I do!!! But sadly the ones here are 1 – not my size & 2 – not even close to new :) Love your stories. And btw… I really think you SHOULD sell your story! You would have to totally write it tho… it’s YOUR words that totally make it. Mama! You are out of control! That picture with them all over the house is making me laugh so so so hard! OH my goodness you goose! Your story is WAY better than that other ‘real’ one! !